The Tennessee Right to Work Law is an equal opportunity law poster by the Tennessee Department Of Labor and Workforce Development. This is an optional poster, so while it is recommended that you post this if it is relevant to your employees, you are not required to by the Department Of Labor and Workforce Development. This poster is optional to post and describes the rights that potential employees have to be free from any discrimination based upon their membership in or not in a union or employee organization of any kind and that it is illegal for an employer to deny or attempt to deny employment on this basis. It appears you don't have a PDF plugin for this browser. 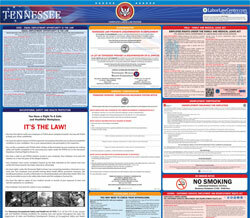 Please see the link below to download tennessee-right-to-work-poster.pdf. charges to any labor union or employee organization of any kind. provisions of this part commits a Class A misdemeanor.